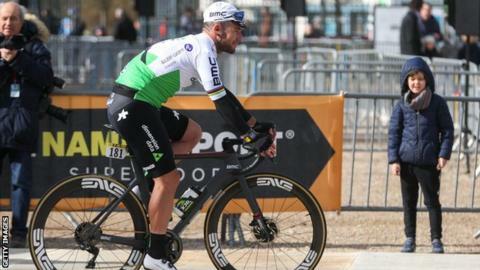 Britain's Mark Cavendish has withdrawn from the Paris-Nice after a "challenging" two days in severe weather conditions. The 30-year-old was one of a number of cyclists who struggled due to strong crosswinds in the first two stages. The 2011 world road race champion has endured a long-term battle with injuries and illnesses. "Mark was forced to stop on the back of a challenging two days," Team Dimension-Data said. "The race was just his third back, following already tough outings at the Vuelta a San Juan and the UAE Tour." The Isle of Man racer, whose 30 Tour de France stage wins put him second on the all-time list, was diagnosed with Epstein-Barr virus (EBV) in April 2017, but returned to action at the Tour of Slovenia two months later. Since then, he has broken his collarbone in a crash at the 2017 Tour de France before suffering injuries in two crashes in March last year which forced him to withdraw from April's Commonwealth Games. His second bout of EBV came in August 2018, which led his team announcing a "period of total rest." Tuesday's race was won by and Ireland's Sam Bennett, with the Netherland's Dylan Groenewegen leading the classification after three stages.